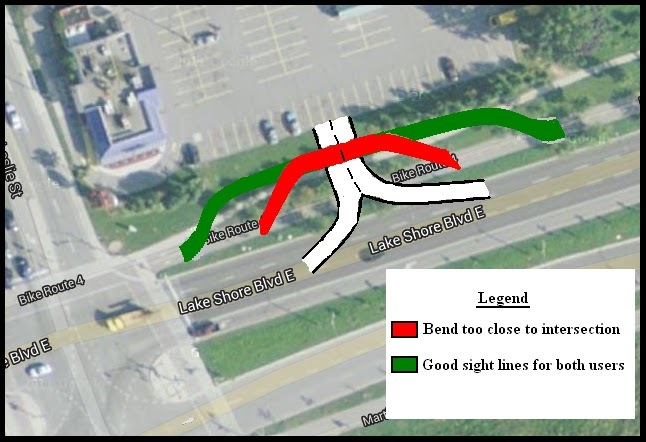 Jog-Downs at Temporary Entrances off Lake Shore into the Big Box Stores at Leslie Street are too Abrupt – Blinding Cyclists to approaching, turning cars. Took a tour of the construction detours of bicycle infrastructure around the Leslie Street reco nstruction today. Many have posted about how happy they are with all the effort and diligence that the TTC and Toronto Transportation have put into these detours – as part of the on-going public consultation process that is happening in conjunction with a major reconstruction of Leslie Street – part of the TTC’s Leslie Barns construction project proceeding now on the south east corner of Leslie and Lake Shore. Specifically, high praise for the jog-downs in the Lower Don Recreation Trail (LDRT) either side of the two Big Box Stores’ temporary entrances from Lake Shore. I supported those kudos when I saw the drawings at the public consultation at Morse Street School a couple of months back – but I hadn’t yet ridden the trail at that location. Lake Shore Boulevard just east of Leslie Street at the Temporary Entrance to the Loblaws Parking lot. But the planners who designed these forgot one key element that makes the vision work well in practice. It’s the idea that each mode should be able to see the other with out looking over their shoulder. The other road user should be visible at a glance through the right side of the windscreen (in the case of the car driver) – and concurrently – the cyclist user should be able to observe the car with out more than a slight turn of their head. With good planning and deployment – the two modes should be in each others’ *Normal Field of Vision* as they both approach the intersection. Unfortunately, the Trail jog-downs at both Big Box Stores temporary entrances do the opposite of this. Because the Trail begins to jog just 12 metres before the intersection, the cyclist is actually traveling slightly away from the roadway at the precise movement when they need to have the vehicle path in their normal line of sight. In other words – the the curve down to the bottom of the jog completes too close to the temporary entrance. I walked the area, measured, and rode it from both directions. The jog-down needs to begin and complete approximately twice as far back from the intersection as it currently does – so that – as the cyclist is coming to the entrance way they are perpendicular to it for some distance. I’ve made a diagram of the Toronto intersection to illustrate my point (see above). Watch the short video and then consider my re-design. The longer approach for the Trail user allows good sight lines for both users. I hope these observations will be of benefit to construction planners of bicycle route detours during roadway reconstruction in the future.